Hidden IP addresses provided by Microleaves does not leave any sight of you on the internet. You can browse easily without any interruption, there is no software which will save your information to for later use. The webserver gets refreshed every five minutes to make sure that it creates a new search by creating new IP address whenever you make a new click. 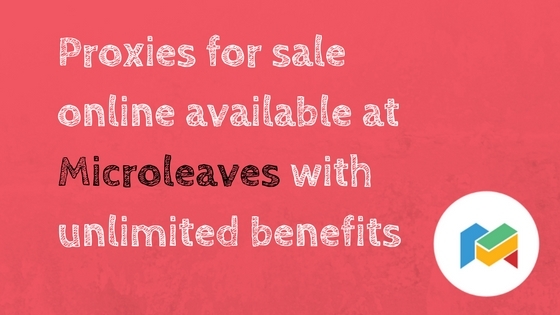 If you go to the history tab your browser when you are using Microleaves proxies for sale, then you will see that there will be no record. One of the disadvantage of this service can be that you will not be able to retain your own search so you will surely have to compromise on that but that is for your safety too. The proxies for sale work just as the expensive backconnect proxies would do, but they are available for reasonable rates so that the clients retained and it would be convenient for them to purchase. There is no custom designs available on the internet so for that you will need to contact the support. If you wish to choose a location for your proxy, then you can do that with the help of GEO location option which is available on the control panel. You can set the location no matter where you want and it will lead you to the web server through that location all the time you are browsing on the internet. The Internet is unavoidable so why take the risk along with it when you know that your information would be shared with people on the web servers from your IP address. Internet usage is regular but less people think about their own safety. They think that they own a computer and it will be safe for them to browse anything they want as long as no one physically is viewing it behind them but by my experience I can tell you for sure that you are not secure online and there can be anytime that your system gets attacked. So the backconnect proxies help you surf the internet with unknown IP address which no one can recognize. Yes, in other words, you are browsing like an anonymous. It changes the IP address everytime you make a new click and makes it like a new search. For the simple IP address, whatever we search for, the servers will record it but with Backconnect proxies, nothing saves because the IP address generates once and vanishes on the other click. If you think ahead of time, then it would be wise to purchase proxies for sale because you never know when it will become so expensive and the need would be high as well in the market. The advance technology not only brings wonders for the people to be happy about but it also brings risks along with it.